Thx Tiborr. I look forward to the second half of GPU testing, particularly 295x vs 980ti (@4k if at all possible). Shame there is no FuryX! @John: Thank you very much. I have tried to mark the TL;DR section a bit better. - Please allow for +/- 2% result accuracy. The overlapping graphs peak/dips are always a good sign of a reliable data aquisition. - Currently all the tested GPUs are powerful enough to drive FHD resolution. At FHD resolution most of the NVIDIA GPUs seem to be CPU bound (as shown by almost identical max and min values). - All of the tested GPUs, including the old GTX 580, are still proving to show adequate performance at WQHD (2540x1440) resolution by maintaining minimum FPS above 30. Smooth gameplay at this resolution starts with R9 280X (HD 7970). All of the tested NVIDIA GPUs are still pretty much CPU bound as the results between the GPUs are close to nill. - Only at 4K the difference in GPU power starts to show - currently, the most powerful GTX 980 Ti and Titan X are in the league of their own while GTX 780 Ti still holds ground against the new GTX 970. 1. If budget allows - get a fast (overclockable) quad-core CPU! Yes, DCS scales great up to 4 cores! 2. Overclock your CPU: Frequency is the king! Most of the GPU performance will be CPU frequency bound. 4. Flying in 4K on PC: On AMD R9 series - make sure to use DisplayPort (DP) 1.2 for 4K@60Hz - do not use HDMI as HDMI 1.4 isn't cutting it (only 30Hz refresh rate). On NVIDIA GTX 9xx series use either DP1.2 or HDMI (supports HDMI 2.0). 5. Flying in 4K on TV: AMD is currently not a good choice for 'cheap' TV 4K. The problem is that these R9 200/300/Fury/Nano cards can only put out 4K@30Hz over HDMI 1.4. The only way to get 4K@60Hz on current gen AMD is to use DisplayPort (DP) video outputs, which works great - 4K PC monitors with DP video inputs are readily available, however DP 4K TVs are not. If your 4K TV only supports HDMI it's better if you get NVIDIA. Alternatively you can purchase DP 1.2 to HDMI 2.0 adapter which bypasses all of the aforementioned issues. At the time of writing (Jan 2016) the cheapest 55" 4K@60Hz TVs with DP video inputs are still 8-10x more expensive than their HDMI 2.0 counterparts. 6. 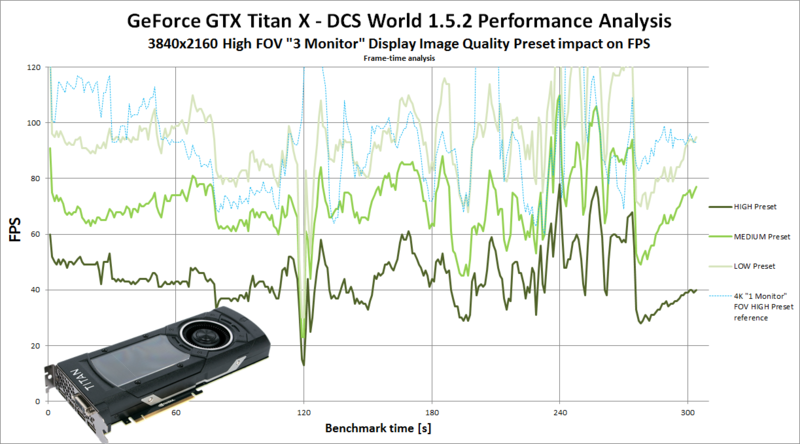 Overclocking of the GPUs tested yield noticable gains starting with WQHD resolution. Lower performance GPUs than the ones tested (e.g. GTX 750) will benefit from GPU overclocking even in low resolutions. 7. It is safe to say GTX 970 is currently the price/performance king for playing DCS at WQHD (2560x1440) and 4K. For playing DCS at FHD resolution a R7 370 (basically only about 10-15% slower than R9 270X), NVIDIA GeForce GTX 960 or even -950 will be great. If money is tight consider higher-end last gen GPUs. Last edited by tiborrr; 01-04-2016 at 12:36 AM. Thank you so much for this tiborrr! I'm in the process of purchasing a new PC, and have been erring about whether to buy now, or wait until the next gen Nvidia cards come out. My main purpose in upgrading is to obtain a quality DCS 4k experience, or, at the very least, WQHD. This testing has been invaluable for me in assisting with this decision. I've been erring because I'm not sure an upgrade is worth it for just WQHD. I know you purists probably cringe at people like me buying pre-builds, but I just can't put the whole thing together myself without screwing something up! I'm looking at getting the following (https://www.pccasegear.com/products/34077), and would be really curious about other opinions on 4k playability (let's assume I also buy a good g-synch etc monitor as well) with a 980Ti. I understand it's a way off being current 1080 smooth, but what luck are others having at 4K? This is a great benchmark for me to come to my own conclusions, but others must be exposing comparable rigs to other DCS scenarios. Sorry to highjack this thread - this is a fantastic forum post by tiborrr, and has really helped me out! Thank you! what would be the most uber components FOR DCS would you suggest to get right now? Last edited by hannibal; 01-04-2016 at 07:28 PM. What about SLI/CrossFire and/or multi monitor setup. What would be the impact on FPS? Last edited by grefte; 01-04-2016 at 12:14 PM. Thanks once more. Now nobody should miss the tl;dr section. Do you have a chance to give a GTX 780 (withoute TI) a test? Would be interesting to see how that compares. This is fantastic. I'd love to see more CPU architecture testing though as I'm running an old i5 2500K at 4.2GHz with 16GB of 1600MHz DDR3 and am wondering what kind of performance this will give relative to Skylake. Wow thank you for that. Thank you very much for this test! I see you test RAM with a total amount of 16Gb, could you run a test with 8Gb? I see some users says that they have better FPS with 16 instead of 8, true? ...I know you purists probably cringe at people like me buying pre-builds, but I just can't put the whole thing together myself without screwing something up! I'm looking at getting the following (https://www.pccasegear.com/products/34077), and would be really curious about other opinions on 4k playability (let's assume I also buy a good g-synch etc monitor as well) with a 980Ti. I understand it's a way off being current 1080 smooth, but what luck are others having at 4K? This is a great benchmark for me to come to my own conclusions, but others must be exposing comparable rigs to other DCS scenarios. glad I could help you out. Actually, in my work we do professionally work with PCCG and the aforementioned rig is a well balanced PC indeed. A lot of power and the right will soar through 4K like it's nothing. It also possesses a nice overclocking potential so there is a way to even further increase performance of the rig! what would be the most uber components would you suggest to get right now? It's pointless to invest more money in e.g. GTX Titan X or Haswell-E platform for DCS. Spend the money on good CPU cooling, power supply and chassis as these parts will stick with you the longest. These are just my 2 cents. You could save additional 100 USD/EUR by choosing i5 6600K instead. I will try CFX on a 295X2 and hopefully SLI on GTX 970 (but no promises on the latter). The purpose of this test is to test out the impact of the multi-monitor high FOV display setup on the general FPS performance. As for the multi monitor setup I did try it out (3x FHD = 5760x1080) and was surprises how demanding this is, despide lower megapixel count (6.2MPix vs. 8.3MPix) compared to 4K. Very large FOV, which is caused with "3 Monitor" option literally drops performance to the floor. "1 Monitor" (WALL) option works perfectly and within expectations - it performs equally good as the single-monitor setup at comparable (total) resolution. - There must be a bottleneck somewhere... Not sure if it's CPU bound, GPU arch bound or DCS engine limitation. - I observed GPU video ram usage - on 4K it never goes above 2.8GB with general preset at High. - I tried lowering Trees Visibility, Lowering Preload Radius, Disabling shadows and HDR: No real improvement, altogether maybe 4-5 FPS better performance on average. Then came the big revelation - the power draw of a system with an overclocked (1400MHz GPU Titan X) used to be up to 380W throughtout the majority of the benchmark. With 4K "3 Monitor" and everything on HIGH settings it only reaches this value for a very short period of time, otherwise it's somewhere between 230-260W. But... When main quality PRESET is set to MEDIUM the power draw is constantly over 300W and average FPS goes sky high instantly! On LOW preset the power draw never drops below 320W. This means the GPU is being starved. I strongly believe there is something with the DCS 1.5 engine not being able to feed the GPU in time when running 3 screens in high FOV ("3 Monitors" profile) WALL mode. Bottom line with high-FOV "3 Monitor preset" multi-monitor setup (BOX): It's playable at butter smooth FPSs for sure however one needs to set general quality PRESET to MEDIUM or LOW! Bottom line with "1 Monitor preset" multi-monitor setup (WALL): Such setup performs equally good as the single-monitor setup at comparable (total) resolution. Therefore it's possible to build a cheap large, high-resolution screen out of smaller panels. 8. Multi-monitor WALL setup - with 'regular' FOV (field-of-view, e.g. "1 Monitor preset within the game settings) - performs equally good as the single-monitor setup at comparable (total) resolution. Therefore it's possible to build a cheap large, high-resolution screen out of smaller panels. 9. Multi-monitor BOX setup - with high FOV (field-of-view, e.g. 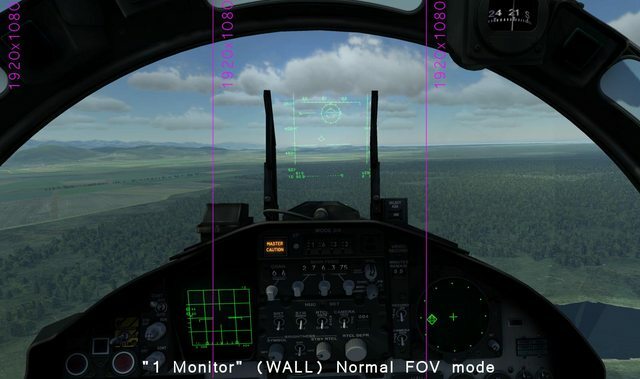 "3 Monitor" preset within the game settings) - heavily taxes the FPS, regardless of your graphics card, most likely because of the DCS 1.5 engine limitation. A workaround is to set the MEDIUM graphics preset to enjoy high FPS. Sounds good I have one GTX 780 non-Ti at work, I might give it a spin tomorrow. I have an 2550K and 2600K somewhere at work, need to dig out my old Z77 mobo and I will give it a spin as well! Last edited by tiborrr; 01-04-2016 at 11:09 PM.